Driving into central Hanoi is like entering a battleground of traffic and people. The broad avenues invite seas of mopeds and cyclos and bicycles to fill them, with all the noise and hustle that goes with a dense population getting about on zippy two-wheeled vehicles. No matter how prepared you may be for your first visit to Hanoi, it will still come as a sensory overload. After such a long journey to reach Hanoi, our first Vietnamese destination, Monsieur and I decided to buffer ourselves against potential culture shock by making reservations at the Sofitel Legend Metropole Hotel, near the Hanoi Opera House and a short walk from picturesque Hoan Kiem Lake. 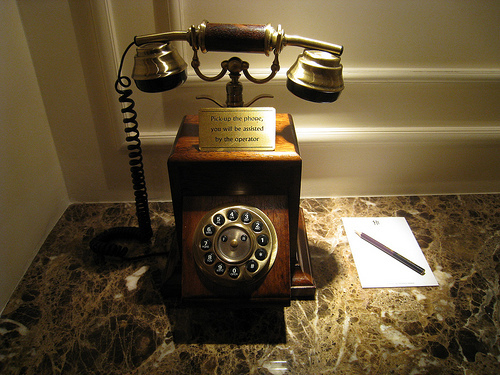 This is a hotel with history. The Metropole was built in 1901 and for the past century has witnessed the comings and goings of presidents, politicians, actors and writers. 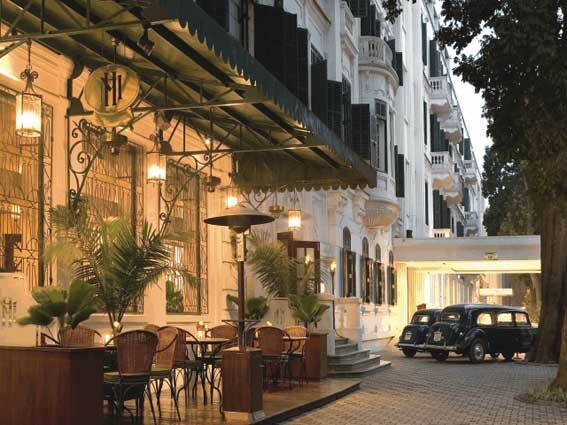 For many of the past hundred years, it has been considered one of the best hotels in Hanoi. Monsieur and I were interested to note that both Jacques Chirac and François Mitterrand were listed as former guests, Graham Greene penned part of ‘The Quiet American’ at the Metropole, and the likes of Charlie Chaplin, Robert de Niro and Cathérine Deneuve have graced its corridors. 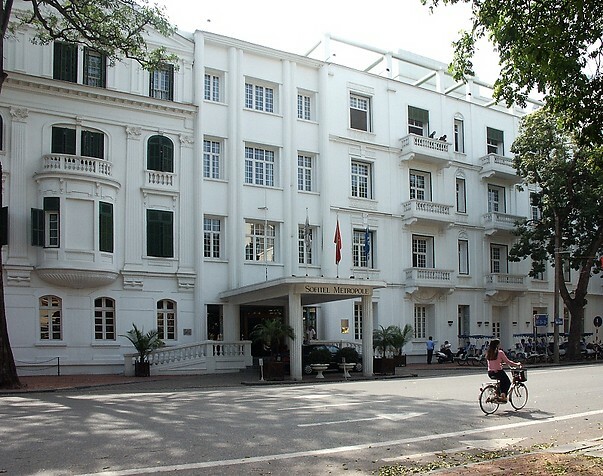 During the American War, correspondents and diplomats used the Metropole as their base, and in 1992 Sofitel reopened this Hanoi landmark following extensive restoration. Our expectations were understandably high as our taxi pulled over in front of the hotel, standing like a large, white oasis of calm in the midst of hectic Hanoi. The building was trademark colonial in style, with evergreen shutters at each window and a pair of vintage cars parked by its entrance, one of which was a beautiful old Metropole Citroen Traction. In the lobby, we noted the wood panelling and old-fashioned ceiling fans as we were greeted by staff in suits or flowing white Ao Dai, the graceful tunic and trouser sets that form part of the traditional dress of Vietnam. “Bonjour Monsieur! Bonjour Madame!” they chirped eagerly. Quite naturally, or so we thought, Monsieur and I replied to such greetings in French, but we were rewarded with blank stares of miscomprehension. Certainly, French used to be widely spoken in Vietnam, but nowadays English has taken over. French is only really spoken amongst French visitors or by the older generation who learned the language under French rule. Still, we gave the staff ten out of ten for trying, and wondered if Sofitel might give them some in-house French-for-hospitality lessons. They’re part of a French hotel group, after all, so it couldn’t hurt. I’d hoped we’d be staying in the colonial wing, but on arrival we were upgraded to a room in the modern Opera wing to the rear of the hotel. Apparently the rooms are larger there, but the Colonial Wing rooms have ceiling fans and antiques. Would we mind? To reach the Opera Wing, one of the Ao Dai girls led us past moon cake displays and boutiques and restaurants and old fashioned telephones to a lift up to the executive floor. There we were greeted and seated in the club room and offered tropical juice welcome drinks as we were checked in and our passports taken for police registration. This was certainly civilised. There was an afternoon tea buffet in an adjacent room, where we were encouraged to refuel before tending to the serious business of unpacking. Monsieur and I were only too happy to oblige. There were mini croques monsieurs, tiny tuna rolls, little beef sandwiches, cakes and petits fours aplenty. Here we were in Hanoi Heaven. No traffic required. Eventually we tore ourselves away from the delicious spread and headed along the corridor to our room. 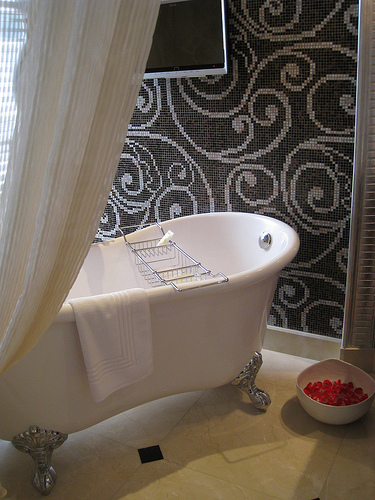 It was huge, decorated in an exotically modern-meets-traditional style, with swirly mosaics in the bathroom, black and white photos of the hotel in times of yore, and deep red accents. We’d be sleeping on one of those dreamy, marshmallowy Sofitel beds, all huge and white and soft and just calling out to us to jump on board. 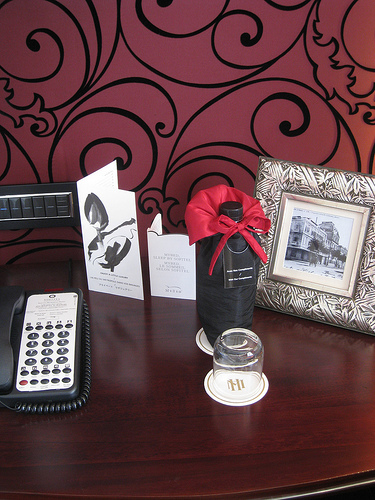 The complimentary bottled water was dressed in little black and red tuxedo bottle holders and the sleeping area was separated from the bathroom’s double vanity by sheer curtains swathed elegantly to the side. 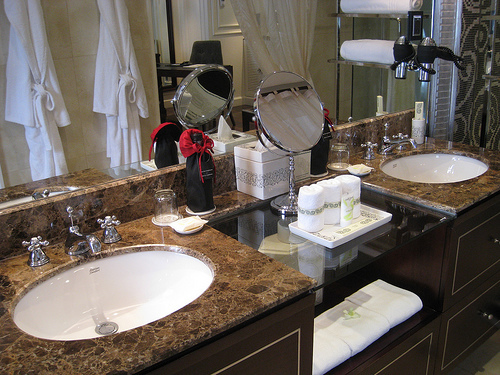 A touch of romance was a claw-footed bath with a bowl of rose petals located just next to the expansive vanity. Sadly, we wouldn’t have time to try it out, but it was a lovely surprise – both decorative and with purpose. For the time-poor visitor to Hanoi (that was us) there was a glass-walled shower. The loo was separate, as it should be, but elegant though it all was, as there were no solid doors either into or out of the bathroom area, it wouldn’t do for people who demand total privacy for their ablutions. Back in the bedroom there was a flat screen TV on the wall and two desks – one by the window overlooking the swimming pool and colonial building beyond, the other across a corner near the door. This room was ideal for the high-powered travelling businessperson. And us. 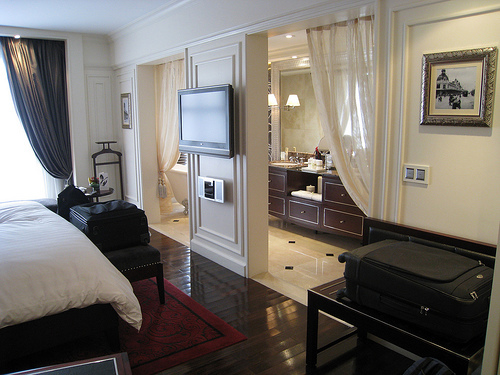 In a luxurious hotel room such as this, I almost wished there were nothing of interest to entice me beyond the door. Alas, this was Hanoi and there was an incredible amount to experience and explore beyond the sanctuary of this hotel, so we braced ourselves for the tidal waves of traffic and went out to see what Hanoi was all about. 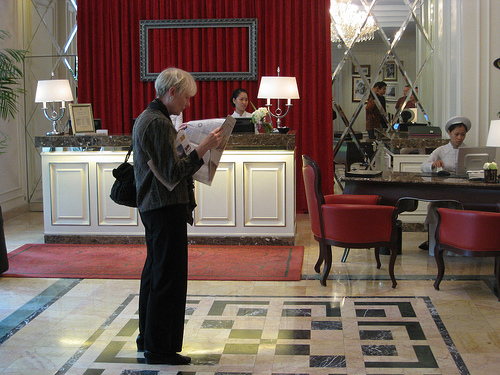 Before allowing us to leave the hotel, however, the concierge insisted on teaching us how to cross the road. Funny. I really thought I’d finished with those lessons at the age of five.